"I always loved luxury, but as I couldn't afford to live in it, I went to work in it." It feels like Paris has played a major role in nearly every film I�ve seen recently. In the past month, my movie viewing has included Paris, je t�aime, Ratatouille and Broken English. The first two pictures were set completely in France�s capital, while the other, less-exciting film journeyed there during its final act. You might think that Paris overload would start to set in, but I can�t imagine growing tired of this wonderful city. Entering Danielle Thompson�s Avenue Montaigne, I hoped for another striking tale of romance and fine things, and this tale fails to disappoint. In similar fashion to several entries from Paris, je t�aime, it maintains a casual tone that remains charming throughout its brisk running time. Cecile de France (Russian Dolls) stars as Jessica�a bright new arrival who is encouraged by her grandmother's (Suzanne Flon) stories to find work in this lavish environment. She is hired as a server at an upper-class caf� situated across the street from an art gallery, large concert hall and a renowned theater. Actors, musicians and other important people frequent this caf� and come into close contact with Jessica. Her experience occupies much of this story, but it�s not really about her character. She moves among the rich individuals and briefly affects their lives as each faces an internal struggle. The primary example is the famed concert pianist Jean-Francois Lefort (Albert Dupontel), who has achieved great success but is sick of the entire game. His wife (Laura Morante) controls the business side and believes in his career, but can�t understand his desire to quit. Jessica only briefly meets him, but her friendly demeanor allows him to discuss some worries and make a decision. This meeting directly leads him towards the final performance, where his frustrations come out at an inopportune time. Another intriguing character is Catherine Versen (Val�rie Lemercier), a highly popular soap star who appears headed for a nervous breakdown. She works extremely late at night on this series, which leads to exhaustion during the more interesting theater work. However, the salary is ridiculously high for the popular show, which makes it hard to deny. Lemercier earned a well deserved Cesar Award for an energetic performance that becomes surprisingly poignant. While initially annoying, Versen becomes more likable as we realize the longing within. Seeing her perform superb comedy on stage reveals a talented actress burdened by her situation. Her demeanor contrasts with the longtime theater usher Claudie (Dani), who blares pop music on her headphones while gliding happily through her workplace. Although this screenplay maintains a light tone, it effectively depicts people facing life�s crossroads. Even Claudie is saddened by her impending retirement and unsure of her future course. Daniele Thompson (Jet Lag) also co-wrote the film with her son Christopher, and their script covers the struggle with skillful grace. 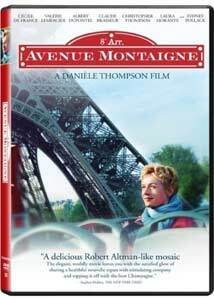 Avenue Montaigne functions as an ensemble comedy because of its romantic elements and generally positive tone. Even the personal conflicts will almost certainly be resolved, which works fine for this type of picture. Thompson likes all her characters and treats them well, which keeps them from suffering more realistic troubles. Jessica does strike up a romance with the author Fred Grumberg, played by Christopher Thompson. The actors have nice chemistry, but their story is less-interesting than Fred�s relationship with his father Jacques. Claude Brasseur brings considerable emotion to the weary man who�s decided to sell all the art he originally purchased with his wife. His amiable persona is present in almost the entire ensemble cast, which raises the overall quality. The picture isn�t a classic, but like Paris, it leaves you with a warm feeling that�s hard to deny. I wasn�t enthralled by every moment, but enjoyed the journey�s relaxed feel, and it�s hard to complain about that reaction. Image Transfer Review: It's really hard not to make Paris look gorgeous, and this 2.35:1 anamorphic widescreen transfer contributes to the growing list of recent films that spotlight the French capital. The film's light tone is matched by the bright colors on the screen, which helps to generate an attractive presentation. Many scenes do take place indoors, so don't expect constant memorable images, but the image quality remains solid throughout the production. Audio Transfer Review: Avenue Montaigne includes several impressive piano concerts that spring effectively throughout the entire sound field. The 5.1-channel Dolby Digital transfer isn't on the powerful side, but it does provide a notable presentation. The audio nicely immerses you in the bustling world of the cafe and easily handles the considerable dialogue. There's also a 2.0-channel Dolby Surround option that works acceptably for limited sound systems. Extras Review: Avenue Montaigne includes one significant extra feature, a 26-minute making-of documentary. This piece avoids the promotional fluff, but instead offers little structure of any kind. We observe plenty of behind-the-scenes footage of the actors working through scenes with Danielle Thompson and shooting them. There are a few interviews mixed in with the director and cast, but they are quick and provide only some minor points. One silly shot presents the actual piano player sitting below Albert Dupontel while the actor mimes playing. While I admire the choice to avoid the typical route, this feature is only mildly interesting. The only other inclusion is the theatrical trailer, which includes some annoyingly obvious English narration. I don't think this preview would have inspired me to seek out this film. Avenue Montaigne was France�s official selection for the Academy Awards, which is a surprise even when you consider its worthy qualities. It�s not the type of film you�ll watch multiple times, but the initial experience should be enjoyable. Cecile de France, Valerie LeMarcier and many others create likable characters that raise the enjoyment of Daniele Thompson�s attractive story. If you can�t get enough of Paris and don�t mind the optimistic tone, I would definitely recommend this picture.